The good: This weekend APL (the boyfriend) and I took a totally spontaneous camping trip to Rocky Mountain National Park to see if the aspens had changed color yet. And we were not disappointed! 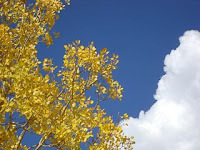 The aspens were all honey golden and absolutely glowed in the sunlight. From afar, the aspen groves made the pine covered hillsides look like they were aflame. On Sunday morning, since I’m not currently able to hike, we drove up a single-track dirt road to the Alpine Visitor Center at 11,796 feet. The view was spectacular. And while we breathed the crisp, clean mountain air and stood in the wind-whipped sunshine, we watched a rainstorm drenching Denver far below us. We were also lucky enough to see several herds of elk. And because the elk are in their mating season, we also got to hear them “bugle.” If you’ve never heard an elk bugle it’s a really difficult thing to describe. The male bugle is sort of like a cross between a high-pitched scream and a squeaky swing set. And the female’s response sounds like some sort of jungle bird. And they just open their mouths and scream out these weird sounds as loud as they can. Made me wish I could do the same thing – I bet it feels great! All in all, we really enjoyed ourselves. The bad: Unfortunately, about twenty minutes into the ride home on Sunday afternoon, I realized that my body had run out of gas several hours before. I had been running on fumes, and there were no more fumes. I had totally gone past my tolerance for activity without even realizing it. Exhaustion hit me like a ton of bricks. And without glowing trees or gorgeous scenery to distract me the swelling, cramping, curling, aching, and throbbing in my joints magnified. It didn’t help that in our serious spontaneity I had forgotten to pack my prednisone, a medication that I am taking to help with the pain while we search for a treatment that works. I missed two doses this weekend, a mistake I obviously can’t afford to repeat in the future. By the time we got home I felt physically destroyed and I dropped like a stone into bed. And, though I am honestly trying my best not to think about before, it turns out to be easier said than done. I lay there in bed, joints throbbing, head throbbing, fatigue smothering me, and I felt like “destroyed” might also be a good word to describe the changes in my abilities. I used to play several water polo games on the same day. I’ve been surf kayaking in Belize. I’ve hiked the half dome in Yosemite National Park. I survived being a 1L, or first year law student, and even managed to do well at it. But this weekend, two afternoons of driving around looking at pretty trees was too much for me to handle. It was a low feeling. A really low feeling. The ok: This will probably sound a little hokey and hippie-tastic, but I joined this “Mindfulness Based Stress Reduction” group, and something our instructor said in class came to mind while I was lying there. She told us about seven “attitudinal foundations” that we should keep in mind to help us benefit from the group. One of them struck me the same way “try not to think about before” did; as really good advice that would probably be difficult to implement. The attitude was “non-judging.” The instructor encouraged us to become aware of the way we constantly judge ourselves and to try to step back from it. I realized that I was judging myself for the physical limitations of my body, over which I have absolutely no control. So I tried to step back from it. Honestly, I can’t say that I was entirely successful. I still felt pretty frustrated and upset by how horrible I was feeling and how little it took to make me feel that way. But I did manage to calm myself down enough to remembered that I am supposed to be taking this one day at a time. And I do want to try to not judge myself for the changes that are happening to me. Though, I expect that it will also be easier said than done. I like the sound of your stress reduction group... sounds like yoga without all the crazy bendy stuff. Woosah. Actually, the whole point of the group is to learn about different methods that can be used for stress reduction. Right now we're working on awareness of breathing, but other types of meditation - including gentle yoga - are on the agenda. And let me emphasize that "gentle" part - I'm clearly not doing anything bendy anytime soon.